to customers, employees and friends that is new, practical, shows consideration and suits everybody? There are presents and presents, we are sure you know what we mean; presents that nobody really wants and presents that are chosen with a great deal of thought. That's the way it is with presents and it is the same when it comes to corporate gifts. Corporate gifts, however, seldom have anything to do with the company; its role on the market, identity, relation to customers, business partners and employees. The gifts that are given are well meant gifts but are, unfortunately, often forgotten. The corporate gift should be a method of communication. The gift should contribute to the trademark being strengthened. It should be a part of the long, everlasting process we call marketing. 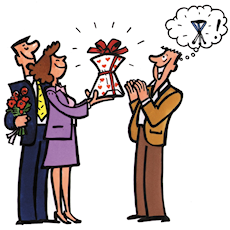 What do you give a person who "has everything" but who you would like to surprise with something personal? Something of high quality without being expensive and lavish? Something that is new and cannot be found in every home? Something that has to do with the company and/or person? Something imaginative and inventive? Something that shows you care? "You think of something," say people gladly who don't have to take on the responsibility. And the responsibility does not become any easier when the company wants to use it to pay their respects to customers, colleagues or business partners. Think of all the occasions when it would be nice to be able to sit down: on a walk in the forest, on the golf course, while hunting or fishing, while waiting for a concert or match to start, or by the side of the pitch watching your child training. You can probably think of many other similar occasions. Wouldn't it be great to have a comfortable stool to keep in the car, boat, your backpack, sports bag etc? Or like many craftsmen, keep it in your tool bag for the lasting relief of your back, knees and joints that are hurt by working in bad postures. Companies that choose to give Walkstool as a gift are offered the chance to expose their logotype or company name on the stool. Every time the stool is used gratitude is thereby directed to the person concerned.